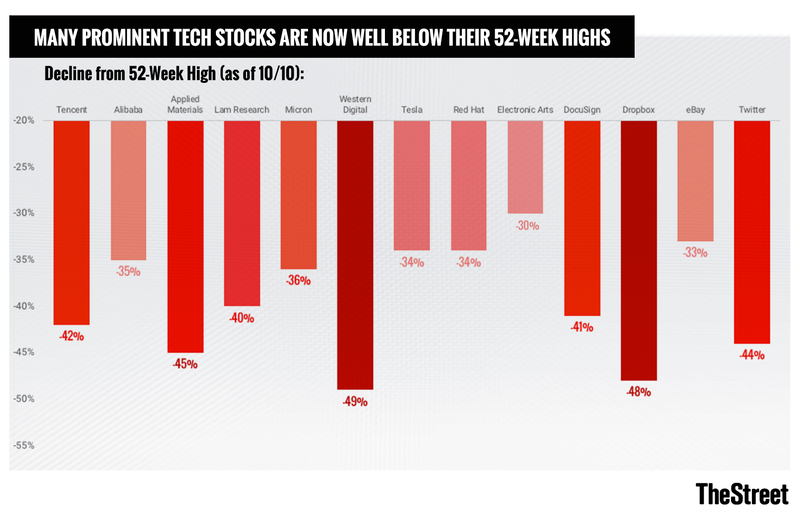 As tech stocks have tumbled amid a broader market selloff, it's worth taking a step back and looking at just how much cheaper many of them have gotten. Lower valuations only matter so much, of course, if the industry and/or macro conditions that a company is dealing with have gotten meaningfully worse. That said, for an investor with a long-term or even a medium-term horizon, the risk/reward ratio looks a lot better for many tech names than it did when they were surging to new highs earlier this year -- even after accounting for worries about trade tensions, higher interest rates and (for some industries) cyclical pressures. Here's a look at how valuations have compressed for some well-known tech stocks spanning several industries/sectors. Both a stock's decline and changes to analyst estimates are taken into account. When appropriate due to major differences in a company's free cash flow (FCF) relative to its reported earnings, FCF estimates are used. Valuation at 52-Week High: At a March high of $62.40, Applied traded for 13.4 times a fiscal 2019 (ends in Oct. 2019) non-GAAP EPS consensus of $4.63. Current Valuation: At a current price of $34.04, Applied trades for 8 times a fiscal 2019 EPS consensus of $4.24. Valuation at 52-Week High: At an August high of $313.37, Arista traded for 36.8 times a 2019 non-GAAP EPS consensus of $8.51. Current Valuation: At a current price of $222.21, Arista trades for 26.1 times a 2019 EPS consensus of $8.53. Valuation at 52-Week High: At a March high of $2,228.99, Booking traded for 22.5 times a 2019 non-GAAP EPS consensus of $99.17. Current Valuation: At a current price of $1,771.18, Booking trades for 17.6 times a 2019 EPS consensus of $100.64. Valuation at 52-Week High: At a July high of $151.26, EA traded for 23.9 times a fiscal 2020 (ends in March 2020) FCF per share consensus of $6.33. Current Valuation: At a current price of $103.55, EA trades for 17.2 times a fiscal 2020 FCF per share consensus of $6.03. Valuation at 52-Week High: At a May high of $64.66, Micron traded for 6 times a fiscal 2019 EPS (ends in Aug. 2019) EPS consensus of $10.79. Current Valuation: At a current price of $42.28, Micron trades for 4 times a fiscal 2019 EPS consensus of $10.53. Valuation at 52-Week High: At a June high of $177.70, Red Hat traded for 28.6 times a fiscal 2020 (ends in March 2020) FCF per share consensus of $6.20. Current Valuation: At a current price of $119.42, Red Hat trades for 19.4 times a fiscal 2020 FCF per share consensus of $6.16. Valuation at 52-Week High: At a Nov. 2017 high of $117.65, Skyworks traded for 14.5 times a fiscal 2019 (ends in Sep. 2019) non-GAAP EPS consensus of $8.02. Current Valuation: At a current price of $85.53, Skyworks trades for 10.9 times a fiscal 2019 EPS consensus of $7.85. Valuation at 52-Week High: At a January high of $60.70, Tencent traded for 35.1 times a 2019 non-GAAP EPS consensus of $1.73. Current Valuation: At a current price of $34.92, Tencent trades for 22.8 times a 2019 EPS consensus (pressured by aggressive spending and the Chinese yuan's depreciation) of $1.52.